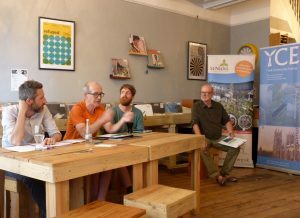 The national “Speak up” week of lobbying on Climate Change took place from June 30th to July 8th – coinciding once again with Community Energy Fortnight. Our ‘Energy Café’ event, organised in co-operation with local sustainability champions St Nicks, was an evening where people could talk with experts to get advice and also debate what we might want to see in future energy policy. Ahead of the event, YCE chair Richard Lane and event compère Anthony Day made an appearance on That’s York TV – you can watch the package on their YouTube channel. 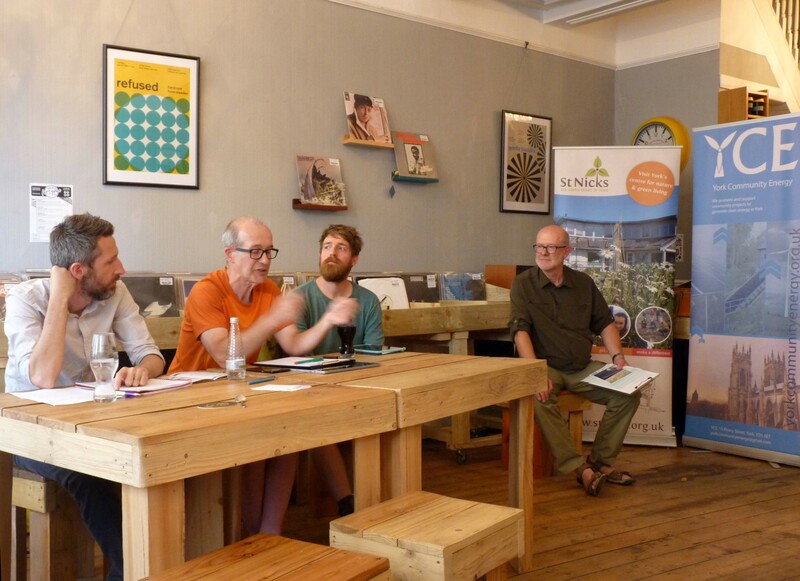 We got a great turnout – thankfully we were not up against an England Word Cup match, otherwise we may have lost at least one of our expert panel! 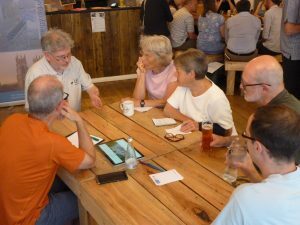 and Mike Bird of Arcus Consultancy Services led a group discussing renewable energy projects, at the household, community and larger scales. Throughout the event policy suggestions arising from the discussion were collected and collated. At the end of the event, compère Anthony Day took us through all the suggestions to solicit reactions from the audience members. Among the policy proposals coming from the event were calls for all new buildings to be required to have either rooftop solar panels or a ‘green roof’ (as was recently debated by the French government for new commercial buildings there), to end the de-facto ban on onshore wind in place since 2015, and to bring building control inspection back into the public sector. We have now compiled the agreed policy suggestions from the audience into a document which has been sent on to York’s two MPs. You can read this document here (PDF download). Both Julian Sturdy (MP for York Outer) and Rachael Maskell (MP for York Central) sent supportive messages to the event. Both MPs were also asked to sign a cross-party letter to Prime Minister Theresa May, written by the Climate Coalition, calling on the Government to aim for net-zero carbon emissions for the UK by the year 2050 – something already pledged by several countries including France, Norway, Sweden, Iceland and New Zealand. Rachael Maskell has already signed this letter (see below) – at the time of writing we have not heard back from Julian Sturdy but we will update this post when we do. 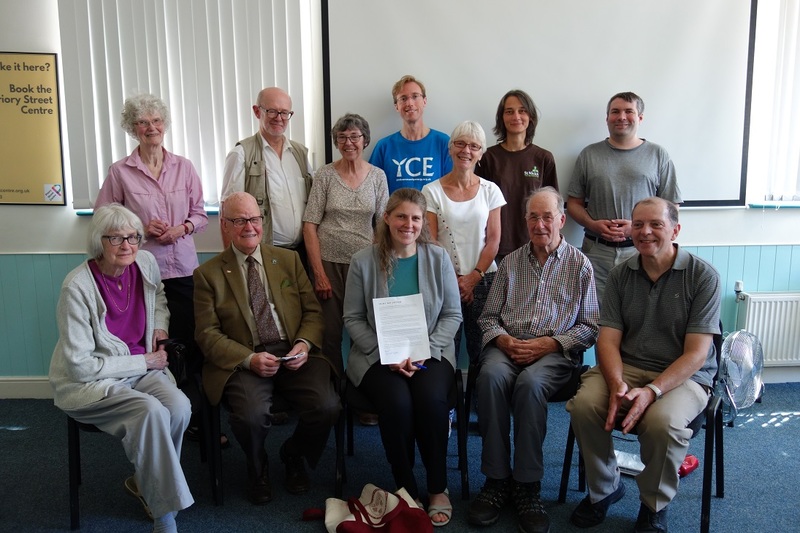 Rachael Maskell MP with local environmental campaigners and the signed cross-party letter. 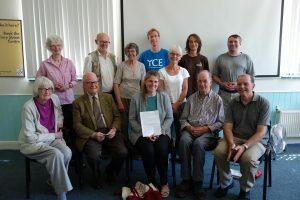 YCE chair Richard Lane was also invited to attend a special Speak Up week surgery with York Central MP Rachael Maskell, organised by local Climate Coalition and Oxfam Campaigns organiser Mark Dawson. Ms Maskell was there to hear the views of a group of environmentalists and answer questions on Labour’s climate policy. Among the issues on which Rachael Maskell was quizzed at the event were those of post-Brexit trade, air quality, home insulation and renewable energy. Post-Brexit trade deals are of concern as they could weaken our environmental standards, and exacerbate climate change due to the higher carbon emissions of longer shipping distances. Air quality causes 40,000 premature deaths per year and is currently worsening. Ms Maskell observed that the situation is further threatened by a new wave of roadbuilding schemes planned by the Government. She pledged to oppose both these and the expansion at Heathrow Airport.